New fasting diet: How does it work? Michael Mosley’s 5:2 fasting diet calls for consuming 2,000-2,500 calories five days a week and 500-600 calories twice weekly. It began with a humble British television documentary that aired against the Olympics last summer. Even the host of the documentary about a new diet thought it would be watched by a few, and then forgotten. But it has since turned into Britain’s biggest weight-loss phenomenon. A word of warning: It’s arrived in the United States. Another warning: It involves fasting. 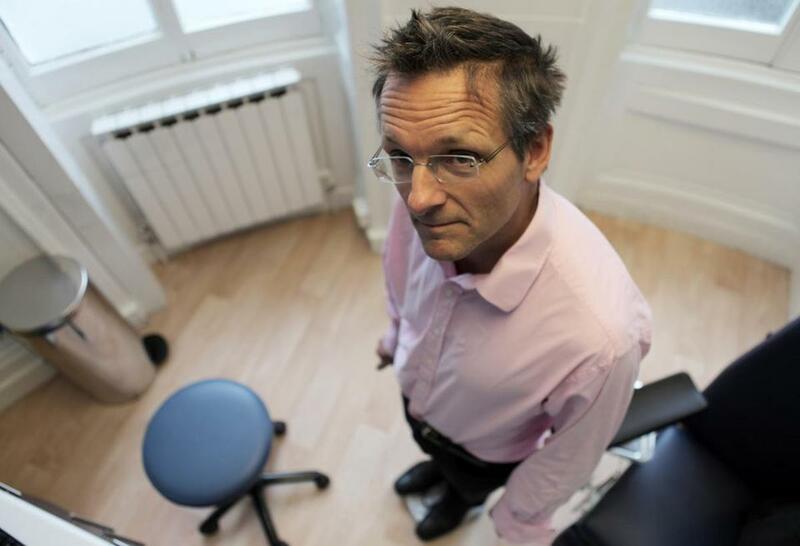 Dr. Michael Mosley, a doctor and television journalist, has tapped into a growing field of research on the benefits of intermittent fasting. From that preliminary research he’s written the best-selling book “The Fast Diet.” It has dominated Britain’s Amazon.com sales charts since it was published there in January, and is currently number eight in Amazon sales in this country. The television documentary, which can be streamed on PBS, launched the British craze of eating five days a week and fasting for two. It’s become known as the 5:2 diet. Fasting days don’t require abstention from food; 500 to 600 calories are allowed. On the other days, recommended caloric intake for men and women varies, but runs between roughly 2,000 to 2,500 per day. Think of the documentary as a reverse “Super Size Me.” Instead of gorging, Mosley tries a number of fasting regimens that show rapid results for weight loss and other health benefits. We talked to Mosley about his discipline and the diet craze he created. Q. You may have noticed, but America is a country of excess. Do you think those of us who love stuffing our faces with peppermint ice cream seven days a week can maintain this? A. That’s the interesting challenge, isn’t it? The trials that have been done suggest that they can. The basic idea is that you have to try things a bit differently. People have been offering the same advice out there and clearly it has not been taken up. Q. Because I’m a huge skeptic, this diet screams fad to me. So many crazy diets have come and gone. Why do you think this one will stick? A. You’re obviously right. A lot of diets have come and gone and don’t seem to succeed in the long run. That really is the test of this diet, to see what happens in a year. All I can say is that research, both in animals and increasingly in humans, suggests over a period of 12 months that people are more willing to stay on it more than a traditional low-calorie diet. But the proof is in the pudding — or in this case not in the pudding. I never attempted a diet before, so I have nothing to go on. But I like the science behind it and the logic behind it. I’m not only losing weight, but I’m also reducing my risk of diabetes. A compelling amount of research suggests that your body goes into repair mode when it’s not eating. A lot of the cellular repair takes place in the period between meals. Q. Can’t we do this sort of thing without fasting? My mother told me a lot of crazy things, but she also told me that if I don’t eat too much, I won’t get fat. A. That’s what I think needs more studies. But there is something about this particular pattern that is better than eating three or five meals a day. One of the things my mother said to me was don’t eat between meals, and one of the poor trends in recent years is that people increasingly snack. Habits are driven by compulsion, and so what happens is that we get a bit hungry, we fill up on sugary things. The next time we get hungry, we want sugary things. If you allow yourself to get a bit hungry on one of the fasting days, what you’re going to fill up on is chicken protein and lots of vegetables, then you will reeducate yourself that when you feel hungry, what you want is vegetables. That’s what’s happened to me. I’m not sure if I’m typical or not, but I like the idea of it. Q. Were you surprised at the reaction in Britain? A. Astonished. Absolutely astonished. I was surprised at the enthusiasm for the documentary when it came out it Britain. Newspapers started writing about it. Quite a lot of doctors starting contacting me, saying they tried it on their patients. I think it’s one of those things where psychologically it’s more attractive because you think to yourself “Two days I can handle.” It’s dangerous to give people too many instructions. Q. Because I have absolutely no willpower, I don’t have a sense of what 500 or 600 calories looks like. A. Nobody does. In the documentary I don’t go into any great depth about it, but there are recipes in the book. I typically have scrambled eggs and ham for breakfast. That’s 300 calories. In the evening I eat a reasonable-size pile of vegetables and some fish. The thing about vegetables is that you really don’t need to count the calories. You can eat pounds and pounds of broccoli for 60 or 70 calories. Q. Can I just drink 600 calories of wine instead of eating broccoli? A. I wouldn’t recommend it. Q. On the days where you don’t fast, can you eat anything you like? A. I wouldn’t recommend that either. My recommendation is to eat normally. Don’t pig out, don’t bury your face in the ice cream. but if you occasionally go out for a burger that’s fine. I think the message is don’t feel guilty. Q. I’m intrigued, but terrified to try it. A. Let me assure you it’s not that bad. Stay off the wine and peppermint stick ice cream on your fast days, and you’ll be fine.